Dating back to the times of Jane Austen, the Jeanmarie Ring features romantic rose cut diamonds in a floral halo of sterling silver. An intricately hand-engraved 14K yellow gold shank splits beneath the halo for a whimsical look. The extraordinary Lucilla Ring showcases a dazzling center diamond accented by forty-eight emerald and onyx cabochons. The shoulders of this Art Deco reproduction display six round brilliant diamonds. 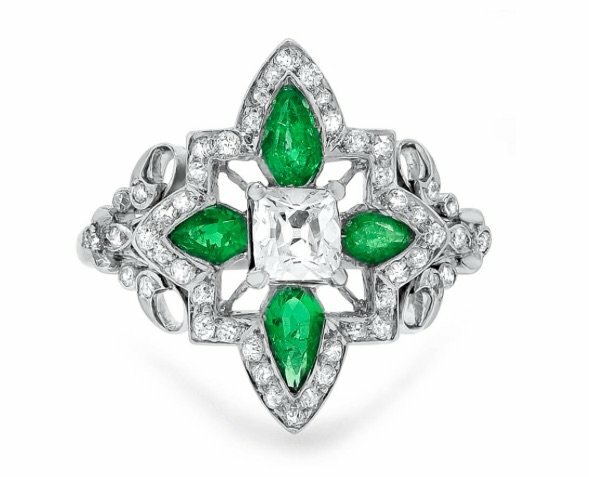 Four magnificent French cut natural emeralds sit at compass points around an old mine cut diamond center in the unforgettable platinum Vicci Ring. 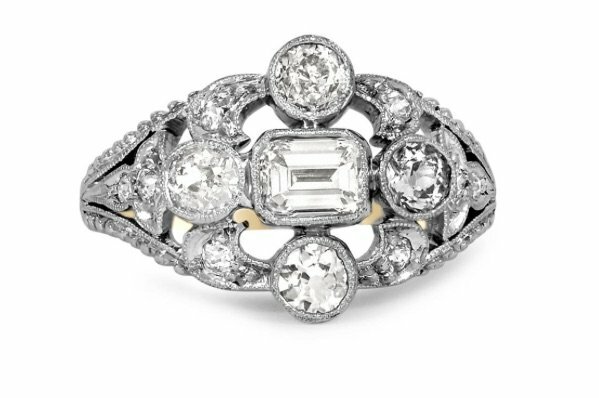 This Art Deco-era design boasts forty-eight diamond accents sparkling along the edges, for an unforgettable look. 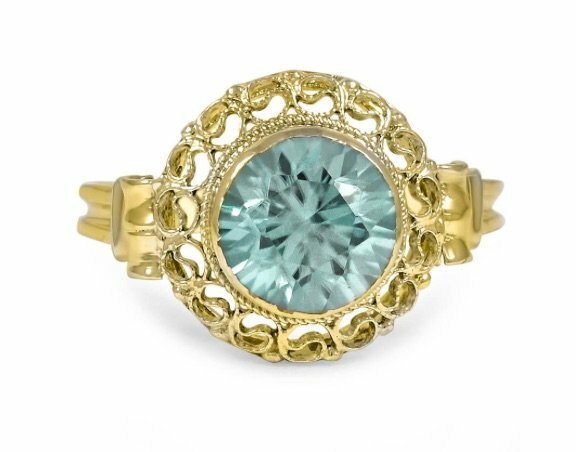 Truly distinctive, the enchanting Art Nouveau Tai Ring features a natural round blue zircon in a bezel setting surrounded by intricate yellow gold wire filigree. 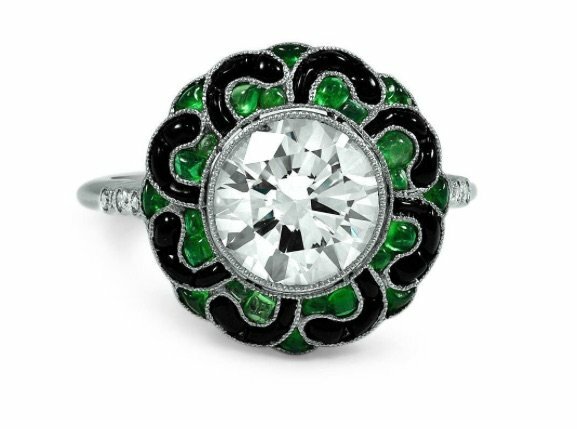 Dating back to the 1910’s, this ring captures the hand-crafted artistry of the Art Nouveau design era. 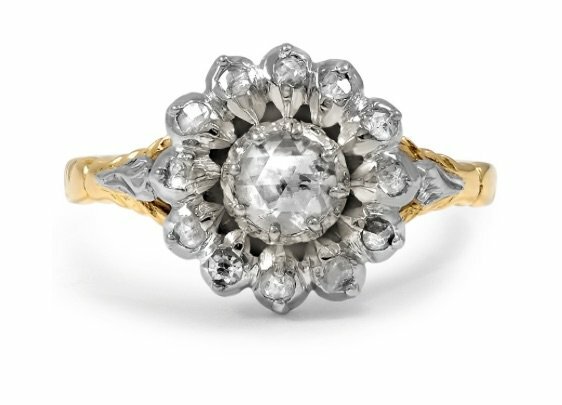 Rich in design details, the Narcisa Ring combines three diamond cuts–a lovely rose cut diamond sits at the center, accented by four rose cut, five baguette cut, and three round brilliant diamonds–held together in a whimsical yellow gold setting. 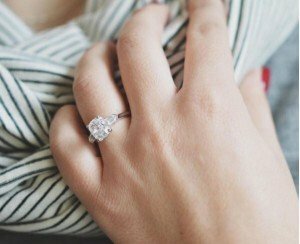 The gently tapered band adds an extra-feminine touch to this extraordinary 1950’s piece. 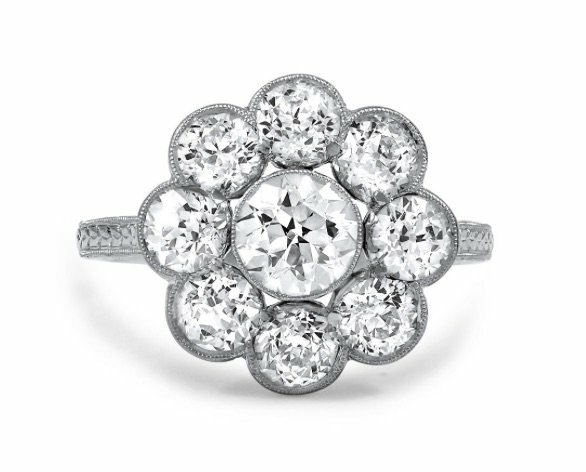 The Marcelle Ring possesses both a feminine floral look and the clean modern lines of the Art Deco era. Featuring nine old European cut diamonds nestled together in milgrain-embellished bezel settings, the ring has an incredible sparkle. Pierced leaf details in the gallery and hand-engraving along the shank add to the ring’s unmistakably antique beauty. 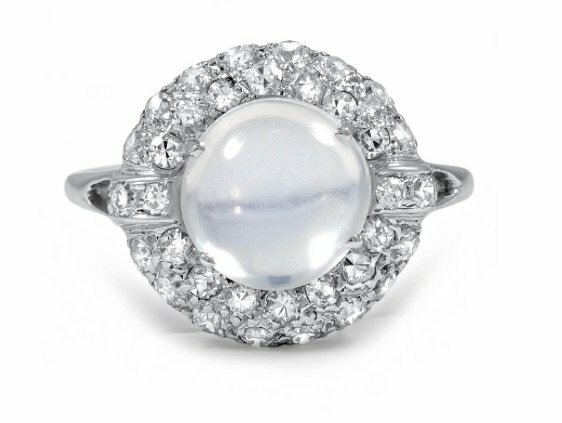 We’ve seen a big interest in moonstones in 2015 and the platinum Christia Ring is a gorgeous example of a moonstone ring from the mid-century Retro era. 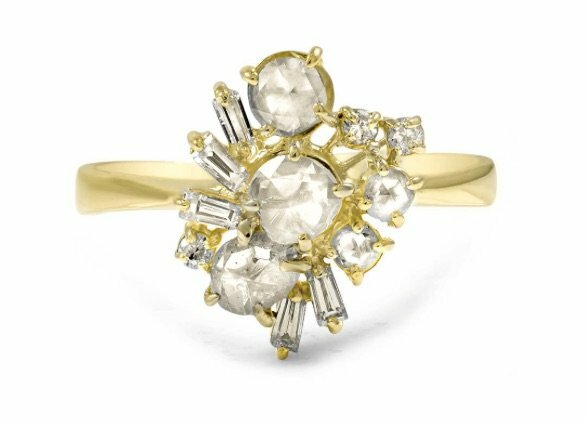 The design surrounds a moonstone cabochon with a glimmering halo of thirty-six diamonds, and would be an ethereal engagement ring. The Lelah Ring combines white gold and yellow gold to showcase a horizontally set emerald cut diamond center, four diamond accents in bezel settings, and eight diamond accents grace intricately pierced details. This Art Deco design from the 1930s is perfectly in sync with contemporary fashion. 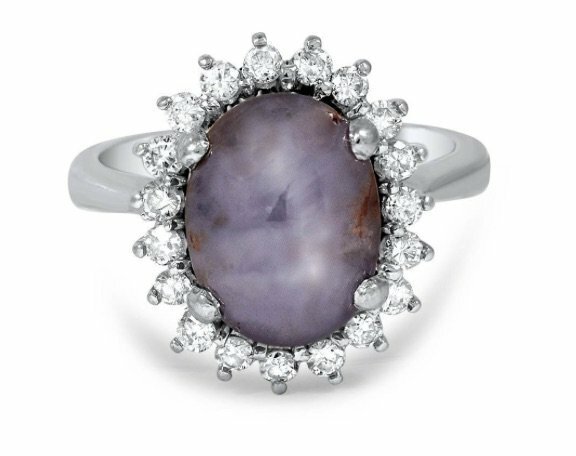 We adore the dreamy look and soft violet blue hue of the star sapphire cabochon at the center of the Retro-era Toya Ring. Nineteen sparkling diamond accents surround the center gem for a glamorous look. 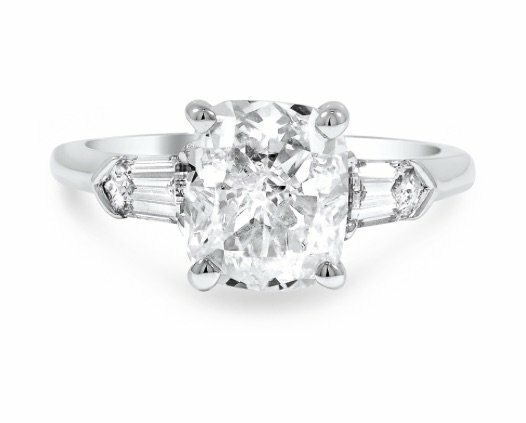 The Beloved Ring showcases a dazzling GIA certified cushion-shaped diamond with a D color grade and VS1 clarity. Two step cut bullet-shaped diamond accents grace the shoulders for a truly regal effect. Which of these vintage beauties is your favorite? Let us know on Facebook or Twitter, or in the comments section!